Have you ever considered what can a chiropractor help with? Have you thought about scheduling an appointment with a chiropractor in regards to your chronic illnesses? Although it is always advisable to consult with your primary care physician, chiropractic care can coincide with the traditional treatment you are receiving. In fact, there are several common health issues that can be eliminated or alleviated with chiropractic care. Are you suffering with frequent headaches? If so, this is one of the conditions that can be treated through chiropractic care. After many major issues have been eliminated as the cause of the headaches, you may want to see if a chiropractor can help. Since irritation of nerves is a leading cause of headache pain for many, chiropractic care is a great option for headache sufferers. The chiropractor will want to assess your spinal system. This assessment will determine if you are suffering from subluxation. This is a condition that occurs when the vertebrae is misaligned in the spine. Spinal subluxation can cause nerve pain and irritation that can lead to headaches. If it is determined that subluxation is causing your headaches, the chiropractor will treat you with the appropriate spinal adjustments and therapies. So, what else can a chiropractor help with? Stress? Yes, stress can lead to tension not only in the musculoskeletal system, but it can also cause tension in the nervous system. The spine is the center of the nervous system, and chiropractors often choose to begin work on the spine in order to address issues within the nervous system. When stress enters into the nervous system, uneven pressure is placed on the bony parts of the spinal column. A spinal adjustment can help reduce any of the irritation that is on the muscles and nerves in the body. This type of therapy can also help to improve blood flow into the body. The chiropractor may also recommend nutritional and dietary changes, massage therapy, and lifestyle changes to help reduce stress. Many patients who suffer with asthma look for alleviation of their symptoms from chiropractors. This type of care can be combined with traditional medical treatments to help reduce symptoms, especially in younger patients. Research has shown that chiropractic care can improve asthma symptoms and the severity of the body’s response during an asthma attack. 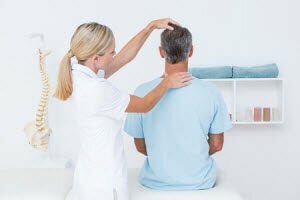 What can a chiropractor help with? A better night’s sleep. Tossing and turning because you are in pain and discomfort is no way to spend the night. If you are having trouble sleeping because of one of the issues listed below, Dr. White can help alleviate your pain through one of many techniques. The list above is just a short list of things that could be causing your sleep problems. Pain may not be the cause, so it is always best to discuss your full medical history with your chiropractor and your primary care physician. If you are suffering from allergies, a chiropractor can help end or reduce your suffering. Since the nervous system is the commander for all of the other body systems, it directly impacts your immune system. With a properly functioning immune system, your body can fight off allergens. However, to have a properly functioning immune system, you must have a properly aligned spine. So, what can a chiropractor help with? You got it, a properly aligned spine that will help you fight off allergens. Being in an automobile accident can cause many different types of injuries. Some of those injuries you do not feel until days later. A chiropractor can help you with painful spinal injuries caused by auto accidents. These injuries can lead to pain in the neck, low back, shoulders, between the shoulders, and cause headaches and sleep disturbances. If you have been in an auto accident and you need your injuries accessed, see a chiropractor right away. What can a chiropractor help with? If you are suffering with chronic ailments, you should consider visiting a chiropractor. You can discuss your symptoms and the chiropractor will decide if a chiropractic adjustment, spinal decompression, massage therapy or one of many other types of therapy can help reduce your pain or other symptoms. Greater Atlanta residents trust Dr. White at Champion Chiropractic with the services they need. Call (404) 345-1609 to schedule an appointment with us today at our Alpharetta office.